4. The speed of conveyou is infinitely variable speed. 1. Max capacity transmission: 10 kg. 2. Seal belt size: 1.5x75 cm. 3. Bag feeding speed: 0-12 (m/min). 4. Power: 110/220v 570w. 5. The hight adjust range of transmission platform: 0-3 cm. 6. Heating temp range: 0-399¢XC. 7. Net/cross weight: 30/32. 8. 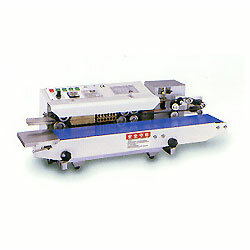 Machine size: 80x40x30 cm.